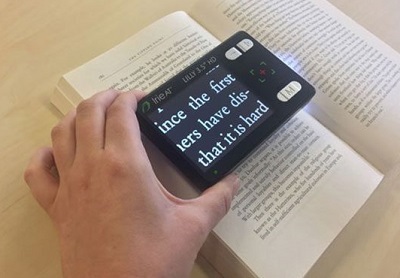 This pocket-size electronic video magnifier is designed for people on the go! With a large 3.5" high- definition viewing screen the Lilly HD is perfect for reading price labels, restaurant menus, medicine bottles, receipts and more! And because it is small and only weighs 1 pound it will easily fit in a pocket or purse so you can take it everywhere you go. Regain your independence outside your home with this convenient little travel companion! Foldable writing or reading stand - complete forms, sign checks and more! Lightweight - less than 1 pound! Replaceable battery offering 3.5 hours of continuous use!